I’ll admit: I’m already a fan of Damien Chazelle. I’m not sure if it’s because he’s only a few months older than I am, or if it’s how I can personally relate to the subjects of his films. I understand the obsession he covered in Whiplash (2014). I can relate to the dreams of creative individuals he brought to light in La La Land (2016). Now, Chazelle has used his filmmaking talent to cover another topic I have a great interest in: space. First Man (2018) feels like a film that’s been waiting for the right director to come along, and Damien Chazelle hit it out of the park. Lying somewhere between The Right Stuff (1983) and Apollo 13 (1995), with a little bit of Interstellar (2014) thrown in as well for style, First Man does a fantastic job of showing how dangerous the missions that landed us on the moon really were. There seemed to be an adherence to realism in this film that helped to convey how claustrophobic, terrifying, and risky these few dozen missions were. The fact that we even successfully pulled off the “moon shot” is a testament to the engineers that made the program succeed. While the segments set in outer space help to define the film’s three-act structure, following Neil Armstrong (Ryan Gosling) from test pilot to Gemini VIII to Apollo 11, they are the breathtaking set pieces that give this movie its strength. Consequently, some of the moments on the ground seemed a little slow in comparison. Granted, these moments felt quite intimate as the audience is shown how private and introverted Armstrong was and how he dealt with the stress of work and family. After all, I think we often forget how the multiple deaths of astronaut co-workers can affect the rest of the team and their families. 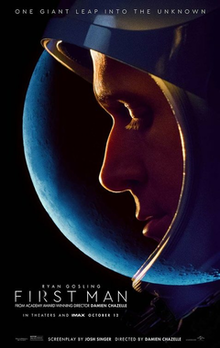 A personal, gripping, and realistic look at what got us to the moon, I give First Man 4.5 stars out of 5.